Lonestar is probably the most talented country music band to ever successfully woo country and pop fans with equal ease and finesse -- without creating any controversy. Let's Be Us Again, their first studio album in nearly three years, shows they haven't lost their magic touch. The title song quickly locked into the top ten of the Billboard and R&R charts. Over the years this group’s ability to straddle the genre fence and keep a firm foot planted on both country and pop radio charts has produced record-breaking results. Much of their success can be credited to the incredible vocal talent of lead singer Richie McDonald. But McDonald would be the first to tell you that Lonestar is a cohesive entity and no one member contributes more than the other. 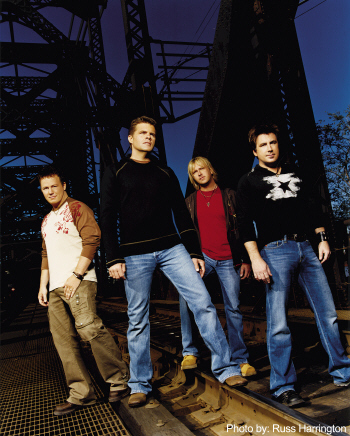 Lonestar’s ability to choose and to create great songs has been a trademark of their success. McDonald, guitarist Michael Britt, keyboardist and group founder Dean Sams and drummer Keech Rainwater, wrote or co-wrote all but one of the thirteen tracks on this album. Their bio states that this new CD mined some of the best melodic and lyrical expertise in Music City as co-writers – and it shows. Take a look at the liner credits – impressive, indeed! Additionally, the band produced the song "Somebody's Someone" which McDonald wrote. Lonestar has said that in many ways their lives parallel those of their fans, and this album supports that statement. For me, listening to "Let's Be Us Again" was one deja vu experience after another. You recognize yourself, or someone close to you, in every song. But "Somebody's Someone," really hit home for me – very close to home. This is a story of how one soldier's death impacts everyone, not just the family and folks who knew him or her. I've said this before, but I'll say it again, being an Army veteran and military spouse I am always grateful to artists who remind folks that soldiers are real people. Throughout our history, we have tended to reduce soldiers to faceless statistics. "Somebody's Someone" reminds us that the loss of a solider leaves not just a statistic, but a gaping hole in someone's heart and a huge void in someone's life. From the small-town "County Fair" through the "Class Reunion," Lonestar sings about treasured bits and pieces of life, and the message is clear -- count your blessings and live the moment -- each and every one. In fact, that's the main ingredient in their music that qualifies them as incorruptible country artists; they have perfected the country music staple – story songs. "I think we finally have a grasp of what we want to say and how we want to say it," Dean Sams reflects. I couldn't agree more. Amen. 7. Let Them Be Little8. T.G.I.F.